Sounding Out: Is radio dead? Is radio dead? Recent Rajar figures show that 16 to 24-year olds are listening to the radio less and less as the years tick by and radio is competing against the big streaming services for their listening attention. BBC Director of Radio and Music, Bob Shennan, has acknowledged that radio needs to reinvent itself to stay alive while others have been more blunt, saying radio as we know it has just 10 years left. And yet, we see that there are new audio formats, delivery mechanisms and types of content emerging that point to a present and future where audio, if not traditional radio, is in rude health. Podcasting, for example, has proved hugely popular in recent years. The availability of high-quality recording equipment, and the ease with which material can be disseminated via the internet, has democratised the broadcasting landscape for would-be podcasters. However, not all podcasts are successful – talented broadcasters are those that understand and possess the same qualities that have engaged audiences for generations: a great idea and great presentation. Looked at this way, are the new and next generation that different to their traditional radio forebears? At the British Council, we are keen to further understand the radio and audio world in greater detail including the technologies, the key players and the opportunities that exist today for young people to get involved. This is vital information to support our long-term planning and programming in the UK and beyond, particularly Southern Africa. We commissioned University of Westminster and MusicTank to conduct research that would provide that vital insight into UK-wide radio, focussing on youth-run and youth-curated content. Subsequent analysis of the research identified key trends across recent years and sought to explain the interconnected networks that operate through various tiers of the radio and audio industry. 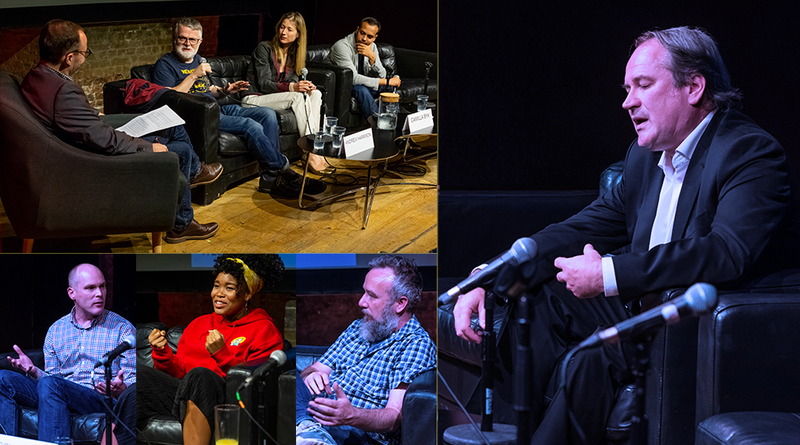 In October 2018, the research was unveiled at the famous Roundhouse venue in London with two panel discussions chaired by Dr Matthew Linfoot (who also led the research) featuring bright minds from the spectrum of radio, podcasting and audio. We’ve highlights below from two panels: thee short clips from a session about radio today and extended highlights from a session about podcasting and storytelling. These sessions are a must-listen for anyone looking for tips on how to get into the world of radio today, what you need to succeed and anyone who wants to know more about creating a successful podcast and the key role of storytelling in successful audio today. Above: clockwise from top left: Matthew Linfoot, Andrew Harrison, Camilla Byk and Ahmed Hussain discuss audio storytelling; Bob Shennan gives his keynote address; Adrian Newman, Niccy Logan and Simon Long discuss radio today. All taken at the Roundhouse, London by Eleni Parousi.